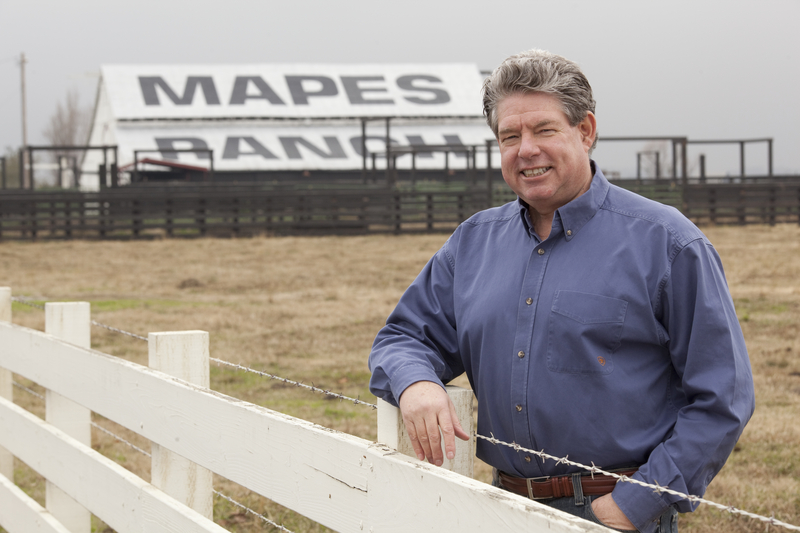 In 1923 Ed Mape began Mapes Ranch outside of Modesto, California in Stanislaus County. The ranch is a 3,500 acre diversified farming and cattle operation producing almonds, wheat, tomatoes, alfalfa, corn, grapes, oats, barley, beans, forage mix, and melons adjacent to 3,000 acres of rangeland. It was Bill and Mary Lyons that started to implement conservation practices on the ranch and over the years Bill and Mary passed these farming principals on to their five children: Bill Lyons Jr., Ed, Jane, Lynn and Louise. William (Bill) Lyons Jr. and his wife Suzy have four children and today Bill Lyons Jr. and his eldest son Billy oversee the majority of the family’s farming and cattle ranching operation. The Lyons family is committed to conservation in agriculture and holds 90 years of leadership in environmental conservation and family farming. Modernized irrigation and drainage systems have been installed throughout the ranch to maximize water efficiency and in partnership with Stanislaus County and local food processors, the ranch utilizes fruit and vegetable waste as a soil amendment. Bill uses an intensive management system to control grazing patterns for up to 2,500 cattle so that the grazing rotation is beneficial to both the grazing lands and the surrounding habitat. Mapes Ranch has made significant contributions to wildlife conservation in the form of habitat easements and through their efforts the Aleutian goose has been removed from the endangered species list. In the early 1980’s Mapes Ranch became involved in U.S Fish and Wildlife Service programs that provided incentives for habitat easements. These easements focused on the non-development of permanent crops or dairy facilities for the purpose of preserving and enhancing open spaces for migratory birds. Providing diverse year-round habitat has led Mr. Lyons to observe an increase in species variety throughout the migratory waterfowl migration period. 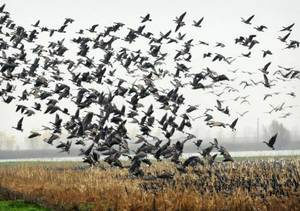 A 30 year relationship between Mapes Ranch and the U.S Fish and Wildlife Service has led to the protection and increase of the Aleutian Goose whose population has reached 30,000-40,000 from the hundreds when it was on the endangered species list. In 2000 Mapes Ranch partnered with the U.S fish and Wildlife Service to begin a habitat enhancement project known as the contour ponds. In the contour ponds project Mapes Ranch transformed close to 80 acres of their cattle ranch into a habitat area with interconnected ponds. They then enhanced this habitat by planting a mix of trees and vegetation as forage crops. 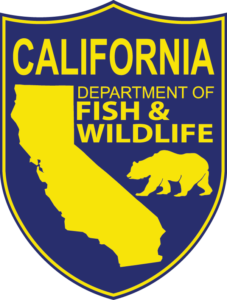 The U.S Fish and Wildlife Service assisted with the project deign and the technical support and Mapes Ranch provided the necessary equipment and labor. Mapes Ranch oversaw the management of the water control structures and this allowed them to adjust the water going to and from the contour ponds according to species observed. The year-round calf-cow cattle operation requires the Lyons family to irrigate their pastures in the summer months and the increased water storage of the contour ponds replenishes the local groundwater. In addition to the contour ponds project, the Lyons family has completed smaller enhancement projects throughout the ranch. Mapes Ranch also holds a CLMA (Cooperative Land Management Agreement), where they manage a number of lands owned by the U.S Fish and Wildlife Service. Mapes Ranch serves as an exemplary template for bringing back threatened and endangered species. Bill indicated that in order for more farmers to implement conservation easements, projects have to make both financial and regulatory sense. To achieve that balance Bill feels that easement programs need to be less complicated and there is a need for ongoing discussions between farmers and regulatory groups. Bill and his family produce a wide variety of agricultural commodities and also support a number of charitable and community causes.